First, here’s my November newsletter, if you’re interested. You can sign up here if you’d like to get them via email. On another note, you can also sign up to receive blog entries via email in the right sidebar. Join in the fun of learning a bit of color theory while planning a Scrap Happy Celebration Hat. And enjoy getting rid of some of your small balls of yarn on the way. During this class, we’ll discuss color theory and then explore different yarn combinations on the way to making this hat. You may or may not cast on, but you will get out of your comfort zone and think about some new color combinations. This class includes an updated pattern with sizing from newborn up to adult. 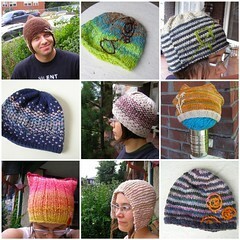 This two-session class will focus on creating your own hat design. Come with ideas, I will help you execute them. We’ll be talking about fit, the math of sizing, length, brims, tops, and everything in between! 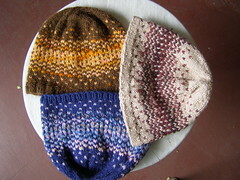 This class will include information about different shapes of hats, sizing, and inserting patterned stitches. Classic, simple lace, is not beyond the reach of any knitter. In this class you will learn several simple lace patterns while also learning how to read simple lace charts. We will discuss yarn and needle choice and see the different effects that can be achieved by using the same patterns in different ways. You bring the yarn you’d like to play with and I’ll provide the play. We’ll also discuss uses for lace in your everyday knitting. Bring in sweaters you don’t wear anymore, great finds from thrift stores, or sweaters with small holes in them and learn how to recycle the yarn from them! 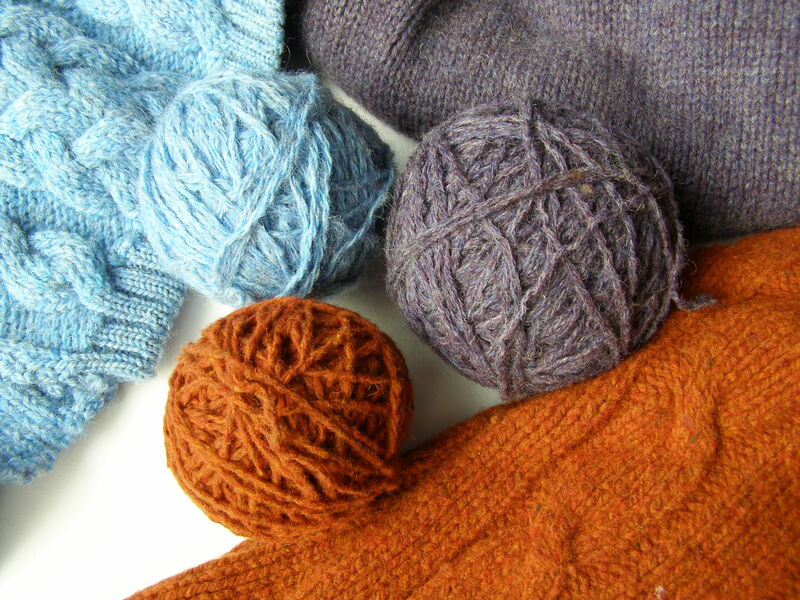 In this workshop, you’ll learn how to spot sweaters that might be good for recycling and all the tricks of the trade of how to best disassemble the sweater and process the yarn. What could be better than a whole sweater full of yarn for $5 and a little elbow grease? Start a project or finish one up! This class is a multitude of things. You could bring yarn you don’t know what to do with and we can get you started on something and discuss what might be the most appropriate kind of project for the yarn. You could get help with an older project, reading patterns, reading charts, or just figure out where you are with an old unfinished object so you can get going again. Either way, put some yarn to good use! 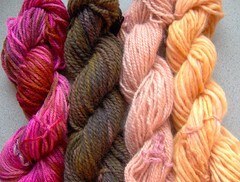 You know that small ball of hand dyed yarn you bought on a whim, or that little bit of precious handspun you love? This is the perfect pattern for it. 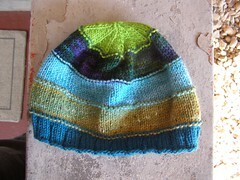 This class will include talk about color choice and explore how to do colorwork. Delve into colorwork and use a favorite yarn? Win, win. In this color theory class, you’ll learn the ins and outs of color basics. Then we will play around with little balls of yarn and discuss how to pick yarns that go together. With any luck, you’ll go home with a new vision of what you can do with color and some swatches of new combinations to try. 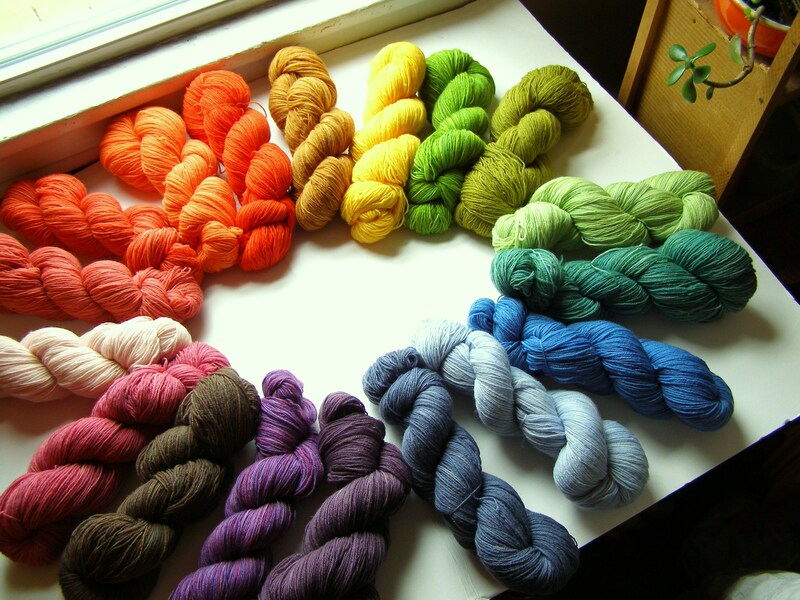 We’ll also discuss picking colors for particular projects – for instance, colorwork, stripes, and trim colors. If you have a project in mind, you can work towards finding the perfect colors for that project. Check out the December classes for some last minute gift ideas… and note that there are 3 special open studios right before Christmas to help you finish up your gift knitting. 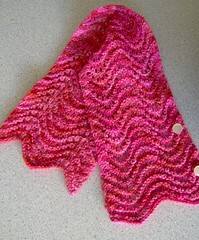 This entry was posted in community, cosyknitsliterally, knitting, spinning, studio by cosymakes. Bookmark the permalink.